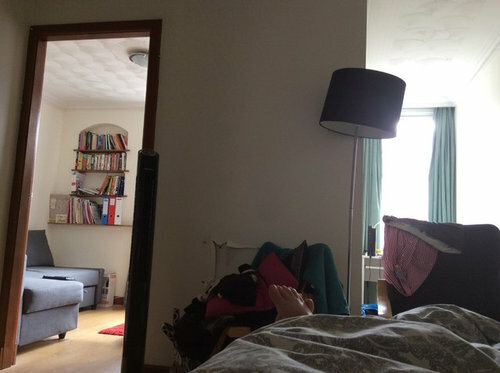 Living in tiny studio in London. Any ideas to renovate cheaply? 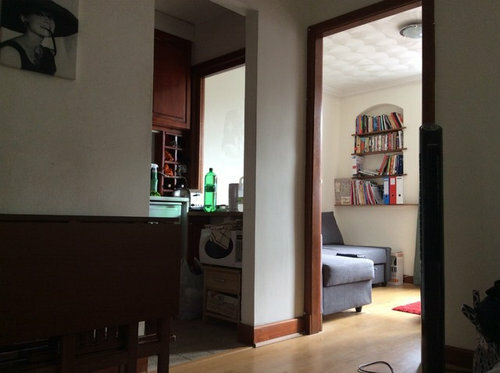 Was originally a studio but has been partitioned by previous owner using stud walls to create a bedroom in the front leaving a strange corridor down the side, to let in light to the back sitting room, which is dark. Kitchen is minuscule about 4x4ft. Has a horrible aertex ceiling. Any suggestions gratefully received. hi! Changing the colour of the wood work to white would make a massive difference. Also: consider contacting a couple of local plasterers for a quote to get rid of the artex? No probs! You have a cool looking space: just go with your heart! If money were no object I would take out the partitions, fit the kitchen as a long run, but a fold down bed so your living space looks bigger until bedtime an decorate in neutrals for a sophisticated look. Thanks for your suggestions. It's served a number of purposes over the years. Children have lived in it and it's been rented from time to time. Now for the first time me and my husband have it back. Open plan would be great but our trouble is people are always wanting to come and stay because of the great location. It's centre of London, Houses of Parliament and Buckingham palace all walking distance. I'm trying to stretch a tiny place to do great things. Did have 8 people staying here one night, including a dog! It's hard to make a total overview of your apartment, but it looks like it could use some objects or pictures on the wall. We use our own magnetic hanger system (a peg board) in our apartment. You can change out the pegs to suit your current needs. In the winter we have big jackets and in the summer we used the "glasses hanger" for our shades. Let there be light. It does depend on the look you want. But artex eeck! If you have high ceilings you can put in a false ceiling and put in downlights. LED strips are amazing and you can highlight the smallest area. Go for daylight bulbs too. Mirrors also reflect the light back into the room. As for deco, If you want to get at least 8 people in. Something modular and that clears the floor. Think Japanese, to zone off areas when there are a group of people use screens, free standing or drop from the ceiling, from the void where you have the downlights. Where there are stud walls you can create storage in the stud voids. Choose bright and white colours. If still not sure support up and coming young designers by giving the brief to the amazing, St Martins, London Guildhall, or London College of Printing, Westminster .... Have fun ! Anyone got any good ideas for making an ex council house look cool?